All fares are per vehicle in Thai Baht, all inclusive of all transportation charges. Tickets to attractions, boat tickets, or tour guides are not included in the package (please inquire if interested). Fares may be adjusted during festivals with high travel volume. • The prices are for private driving tour with driver only (admission tickets and guide are not included). Qualified guide can be provided at added fee (please let us know if required). • If you would like us to drop for boat ride please inform which pier you would like, in the market or at the outskirt. The outer ones have higher fee but the ride is longer along the canals. Damnoen Saduak canal was dug as a connecting canal between two major rivers west of the Chao Phraya River (Mae Klong and Ta Chin). In the old days there were of course no paved roads, just trails for water buffalo drawn carts really, and people really used the canals to travel and trade. 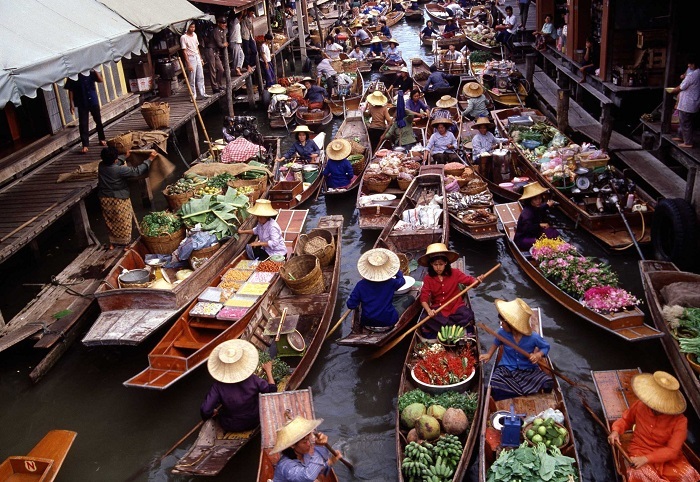 That’s how Damnoen Saduak floating markets came to be – a real trading center on the water for a community. These days with roads and cars taking over the canals and boats, the market is no longer the trading center of the community. But its uniqueness and charm have led to its new role as an attraction. The market is at its best in the early morning before the crowds arrive and the heat of the day builds up. 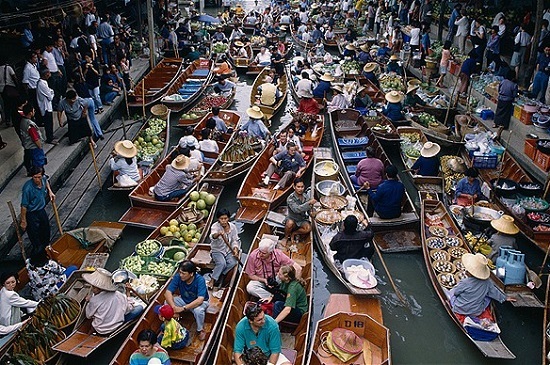 The congested canals are full of paddled wooden boats laden with, fruits, vegetables, noodles, and ice cream. Recently all sorts of goodies like paintings, candles, t-shirts and whatnots are also on offer here. Have fun and bargain hard. 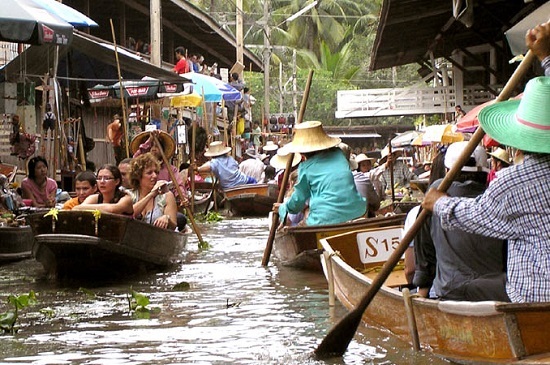 You can also ride long tail boat from the outskirt of the market, weaving your way through the canals to the market and visiting sites like temples or coconut sugar farm. Kanchanaburi town is a picturesque small town lying in a valley with mountain backdrop. 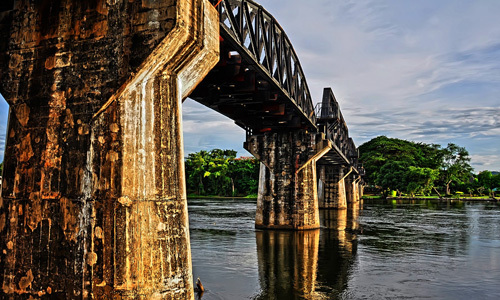 One of its main attractions, the Bridge Over the River Kwai, which was built during the WW II next to the town crossing the Kwai river, is a picturesque site. The bridge of course is the main feature in the famous 1957 Academy award winning movie The Bridge on the River Kwai. 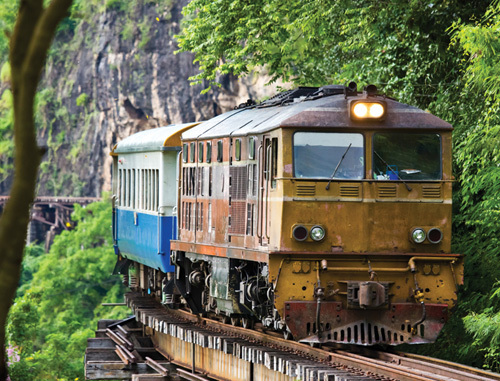 To the west of the bridge, Thai – Burma railway (known also as the Death Railway) runs all the way from the Bridge up to the valleys and all the way into Myanmar. Today the train is still in use to only Nam Tok station. The building of the railway during the WW II is a poignant story. Many people suffered and lost their lives during its construction. 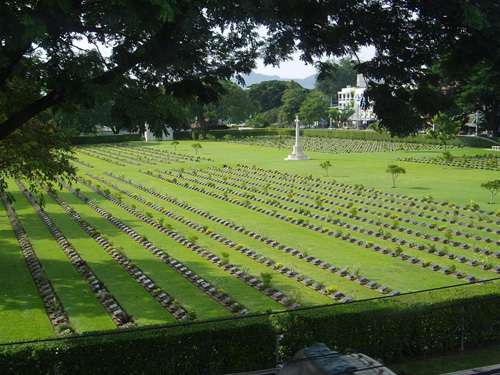 Not too far from the bride you will find excellent death railway museum and the war cemetery of prisoners of war who died during construction of the Death Railway. The place is well maintained. It’s a moving place and is a must visit for those interested in the history of war and mankind.